Work still continues on inviting people to take part in the Hart project I’ve talked about recently. Numbers are rising and we’ve had some good publicity to help with that – a big thank you to those who have already signed up. More news will be out on the sittings very soon. I wanted to step aside from the project for this post and share an image with you – at this point if you’re reading on my website, click the post and it’ll take you to the blog direct where you can see the image. This image features my two children and my mother-in-law, a fabulous lady who had her birthday yesterday. It was taken during the celebration as the children played monopoly with the birthday girl. I like this image a lot. Like a lot that fall in to that category it isn’t, ‘technically perfect’. It was deliberately taken with a very wide angled lens, close up as you can see with the way my daughter look. And there I write the last bit about the technical because the image is so much more than that and I find too many people get hung up on technical points. Working commercially these matters may have mattered, but to dismiss such images because of the odd fault is, I feel, to completely miss the point of them. There’s a whole world of experimental photography where technique plays a large part in the image and that’s where I find the enjoyment in the technical, not in worrying that despite it meaning the moment was missed, moving to f11 would have been a better choice in a post image pull apart. There is obviously value in looking at images and thinking about how they could be improved, but to get hung up on it must surely remove some of the enjoyment. So what do I like about the image? Well apart from the way in which is captures a family moment causing an emotional link for me, I like the general aesthetic. The look of surprise is part of the obvious spark that draws me to the image, the sun is pleasant and the light is nice, the brown and greens with the diagonal lines in both the natural background and the boardgames etc. 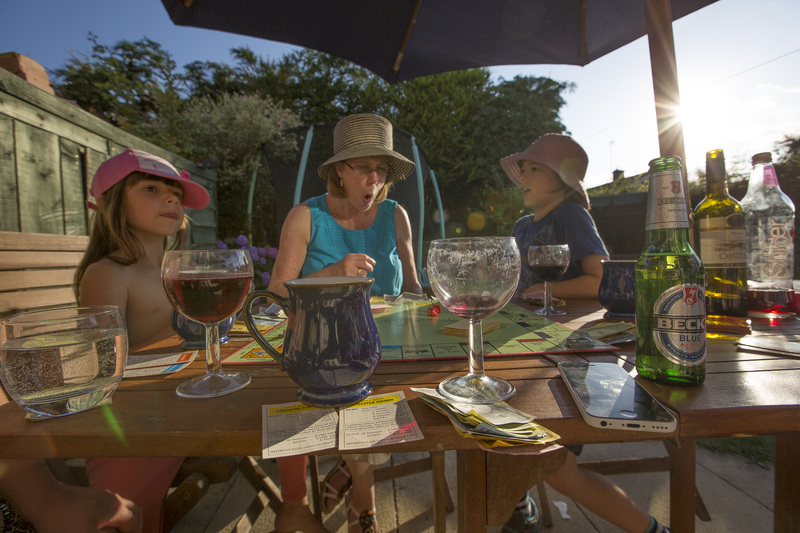 But beyond these the image has a depth with the technology, the array of drinks and the materialistic game being played between generations, (in fact this board was played with by my wife in her childhood) each having a narrative of their own. The choice of hats between grand mother and grandson speaks of the link and the time being spent in each other’s company. There’s more in the image and for some I’m sure less – but that’s the photograph…….